Today began kind of scrappy. From about 4AM on, I couldn't sleep. I considered why and reasoned that my insomnia probably stemmed from worries about this house, and worries about that house, and worries about certain school kids making friends, worry about Hubby traveling again, ... and just plain worry. Oh yes, I know by heart that we cannot add numbers to our days with worry, yet I seem to find it second nature to ignore the verse and keep right on worrying. Yesterday, I took all four kids to 'the WalMarts' after school to grab more spray paint and some plant fertilizer, since - you know, I'm designing to dwell in this house (yeah, right. haha. stifle feigned, albeit forced laughter...). 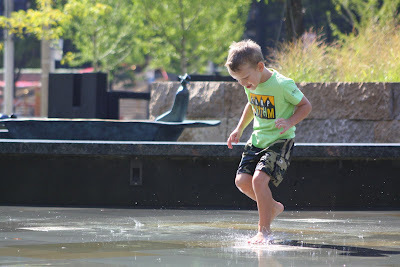 The kids wanted to play in the shrinking display of fountains in Lawn & Garden, and I appeased them by promising they could do so when we came back through to check out. As soon as we came through the door at the end of our quick excursion, Sashi took off for the little bird baths, a smile etched onto her face and Meiners in fast pursuit. 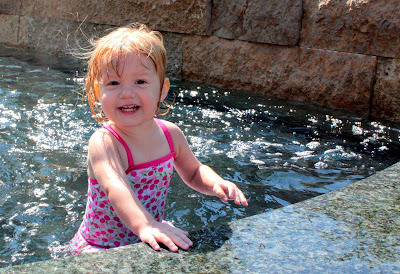 Smiles soon gave way to screaming and crying when the back door Door Greeter squashed the kids' plans to splash in the water. Evidently, Ms. Fussy Door Greeter had had enough of kids splashing on her grounds for the day, and she sent the kids walking (or running) back to Mama with giant splashless alligator tears streaming down their faces. 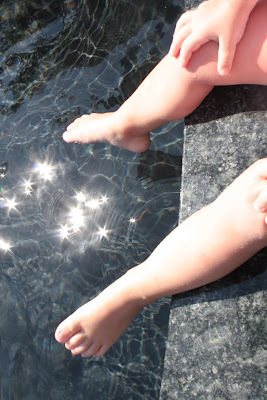 I refused eye contact - cuz good grief, what's a little splashing among friends - and told tales of splashing in city fountains to appease their sadness. Not long ago, my dear friend Faith shared photos on her blog here of the new City Garden in downtown St. Louis. 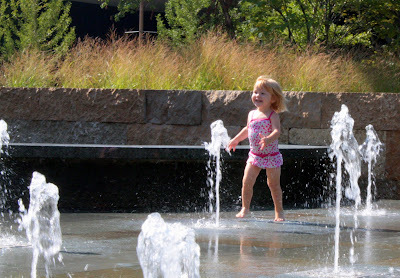 I decided that since my kids couldn't splash in WalMart fountains, I'd be sure and let them splash in City Fountains. After a sleepless night of worry, with the two big kids off to school, Meiners, Sashi, and I took a trip downtown. After we redeemed our splashless Monday, we ate hotdogs from a street vendor and soaked in the beautiful day. I sat with two of my kids planted in my lap and soaked up the lovely of this Redemptive Day.